As the emerging market of the e-Commerce industry, we at MBE believed our PUDO services will be a total solution for your business in facing current challenges and also catering the diverse needs. PUDO at MBE means Pick-Up, Drop-Off and Return Point and these are all available at our MBE centres. With our specially designed services, you don’t have to worry at all. At MBE, our expertise and experiences are our core strength with more than 70 centres nationwide, open 7 days a week, located in prime areas, shopping malls, petrol stations, and strategic retail location. Time is Money - Now your customers don’t have to wait all day at home for their packages and more frustrating when they experiencing missed deliveries. Giving your customers the power to choose where and when to pick-up/self-collect is an amazing shopping experience. 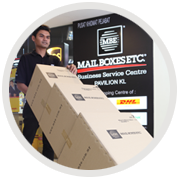 Our packaging solution can satisfy all your needs. No more waiting at home - Your e-merchants and e-tailers are the key roles in the system. We believe our Drop-Off option will benefit them all. Your merchant or customer can now Drop-Off their parcel at their own convenience. Returns made Easy - When you’re offering a return option to your customer, we at MBE simplified the process. Returning a package will be expedited with no hassle. Easy returns lead to a happy customer!